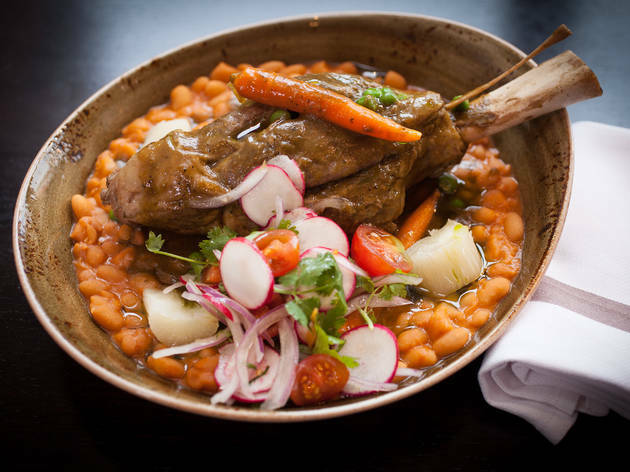 Photograph: Martha WilliamsTiraditos Criollo at Tanta, a new restaurant from Peruvian celebrity chef Gaston Acurio which opened in River North in July. 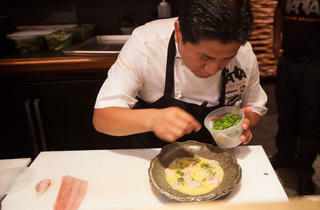 Photograph: Martha WilliamsTanta, a new restaurant from Peruvian celebrity chef Gaston Acurio, opened in River North in July. 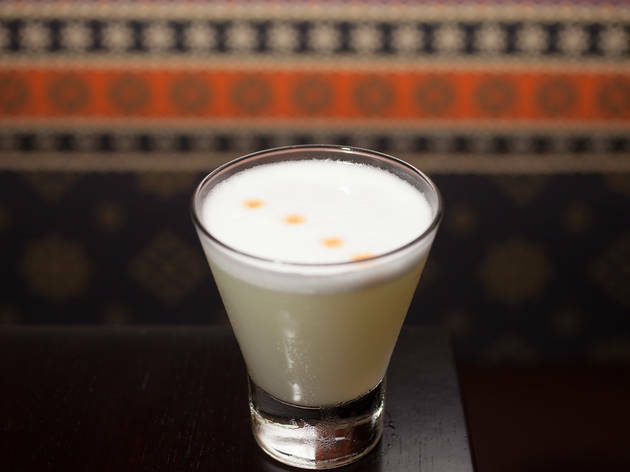 Photograph: Martha WilliamsPisco Sour at Tanta, a new restaurant from Peruvian celebrity chef Gaston Acurio which opened in River North in July. 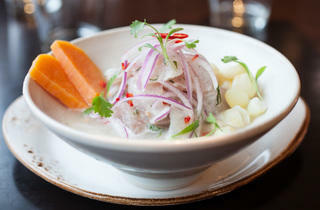 Photograph: Martha WilliamsSeco de Cordero at Tanta, a new restaurant from Peruvian celebrity chef Gaston Acurio which opened in River North in July. 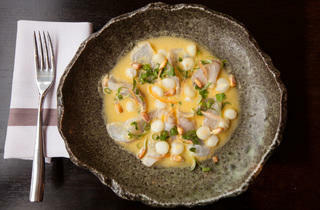 Photograph: Martha WilliamsCebiche Clasico at Tanta, a new restaurant from Peruvian celebrity chef Gaston Acurio which opened in River North in July. “Is there a rule that at a certain hour every River North restaurant has to change their soundtrack?” my dining companion asked me as club-like beats started playing in the background at Tanta right at 9pm. 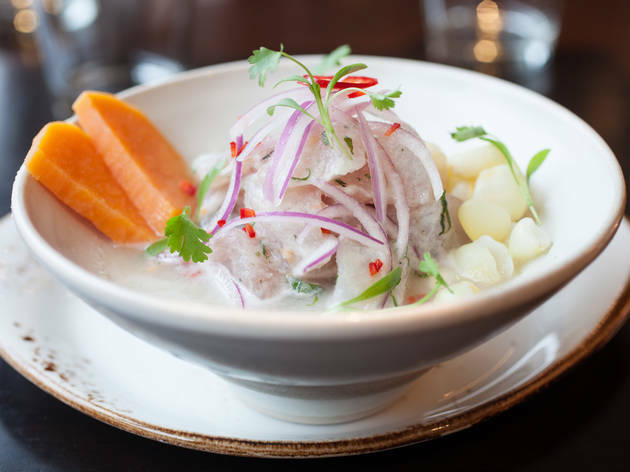 At first glance, the new Peruvian restaurant feels like just another River North restaurant—a huge colorful mural on the wall lends a festive vibe, there’s a long bar where guys in suits are drinking vodka on the rocks and the restrooms are located downstairs. 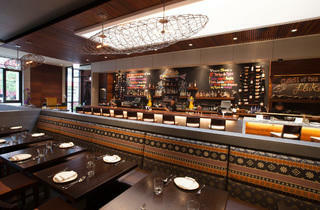 But once you move away from the bar and start eating and ordering off the cocktail menu, things at Tanta feel different. It’s more serious, more delicious, and the crowd skews older, with most tables filled with several generations. 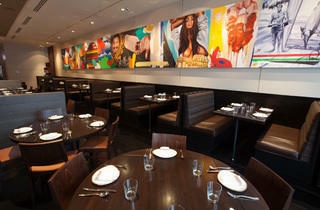 Tanta is the third American restaurant from Peruvian celebrity chef Gastón Acurio and his first in Chicago. 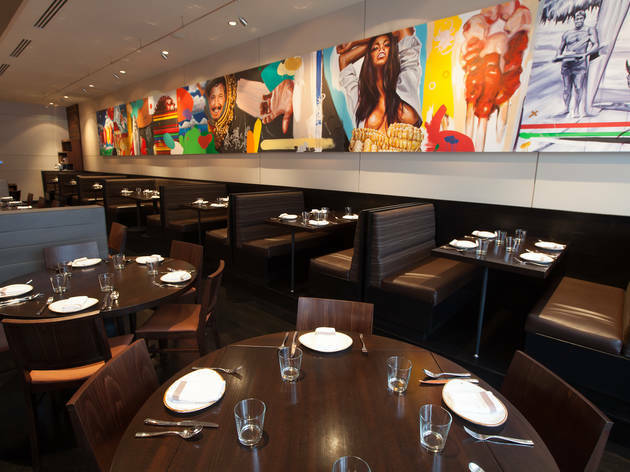 Acurio has more than 30 restaurants around the world, including La Mar in San Francisco (a New York location of La Mar closed last month). 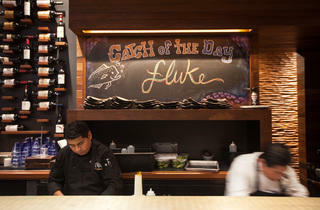 He also has Lima’s Astrid y Gaston, which is on the World’s 50 Best Restaurants List. It’s also his third Tanta—there are already outposts in Lima and Barcelona. 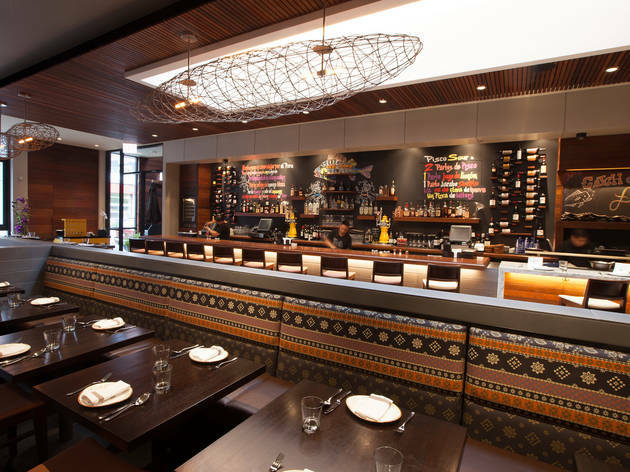 It may be because of this that Tanta is strong right out of the gate—service is prompt and knowledgeable and despite a few minor quibbles, chef Jesus Delgado’s kitchen is turning out dishes that are nuanced and thoughtful. 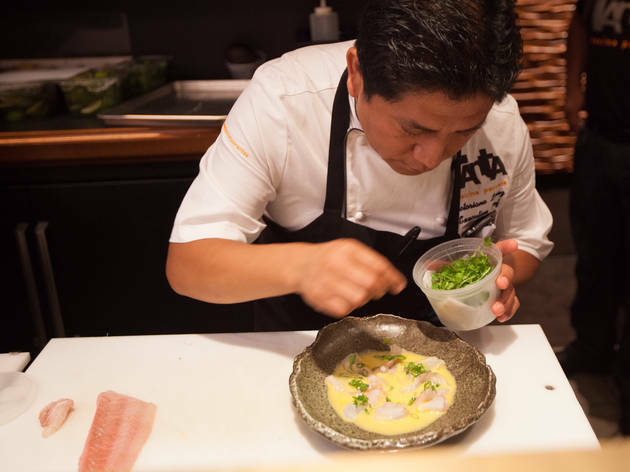 Peruvian cuisine draws on influences from cultures that emigrated to the country, especially Japan and China, and Tanta’s menu reflects flavors and techniques from these cuisines. There’s a mix of small and large plates on the menu. 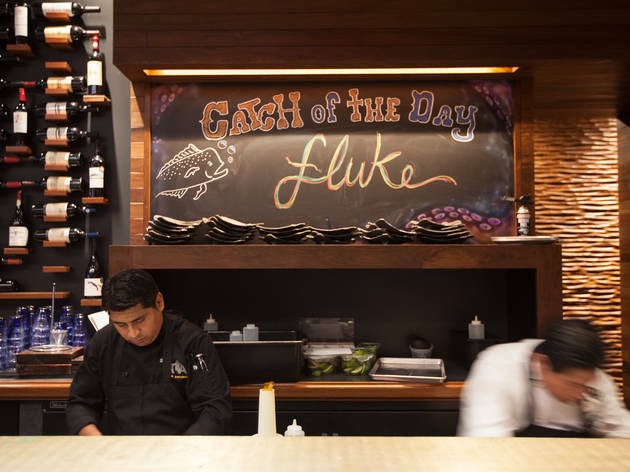 It would be easy to build a meal with the two-bite size anticuchos or nigiri plus a ceviche or two. Potatoes are a staple in Peruvian cuisine and they’re present in two different starters—the clasica causita, with crab salad, avocado, tomato and egg placed atop a nugget of whipped potato, and the pulpo anticucho, with warm chunks of potato, octopus tentacles and roasted red pepper served with salty olive puree. The latter are more rustic, but more complex in terms of flavor—the causitas are enjoyable and more beautiful, but they’re more like cocktail party bites than the earthy, street food-inspired anticucho. Rounding out the smaller plates are Peruvian spins on nigiri (the mahi, avocado and sweet potato nigiri had a smoky, smoldering burn and we couldn’t taste anything beyond smoke) and three categories of ceviche, traditional preparations: tiraditos, which are made “in the spirit of Japanese sashimi” and feature larger pieces of thinly-sliced fish, and Leches de Tigre, which is touted as a hangover cure and which our server told us we should pick up and drink. 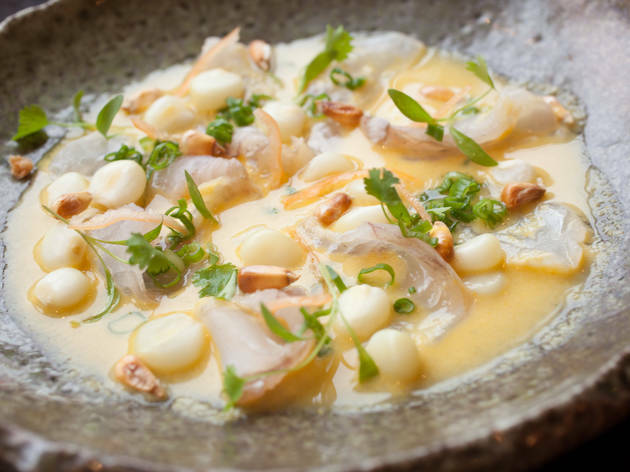 We tried the classic preparation of the Leches and the ceviche mixto, made with shrimp, fluke and squid, both of which were well-balanced. But they were muted compared to the bright criollo tiradito, which featured fluke marinated in a bath of ahi amarillo, ginger and lime. 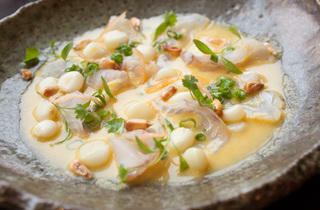 The colorful dish was accented with large kernels of Peruvian corn, some raw, some crispy, which add varying textures. 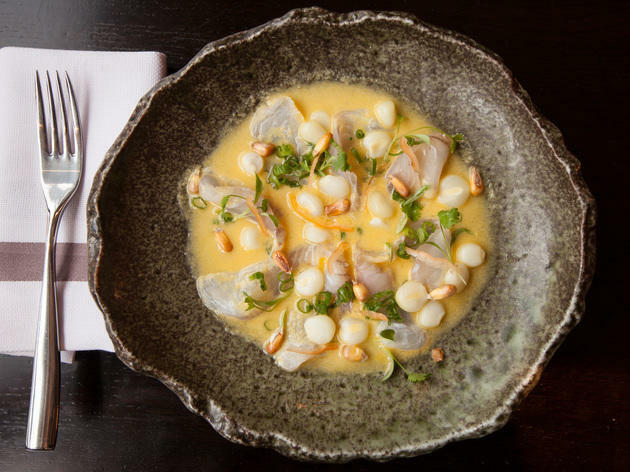 If you only order a single ceviche dish, make it this one. Speaking of that corn, you’d better like it. It appeared in most of the dishes we ordered, including the mixto ceviche and the jalea, an entrée-size pile of lightly fried shrimp, fluke, octopus and yuca sitting on a bed of avocado salsa. The yuca is so delicately flavored that it doesn’t contribute much to the dish, but the seafood is sweet and light. Other entrees feature traditional dishes, like lomo saltado, or chaufa aeropuerto, a Chinese-Peruvian fried rice dish that our server told us was reminiscent of bibimbap. It is, and there are layers of flavor—a shrimp omelet is placed on top of the dish and the server cuts it up and mixes the whole thing together; there’s smoky and salty pork, herbs and garlic. “This would be great hangover food too!” my friend said. “But will it stave off a hangover if I eat enough of it now?” I asked, sucking down another cocktail. 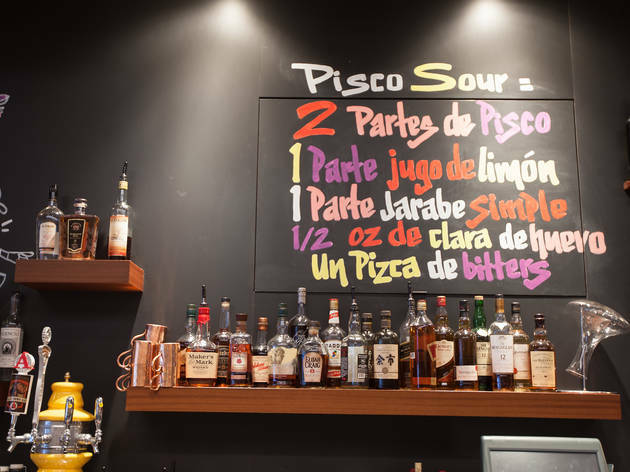 The pisco-heavy cocktail menu is tongue-in-cheek—there’s a pisco Moscow mule dubbed the Lima Llama, while the aptly named Crowd Pleaser has enough sugar and fruit to overshadow the fact that there’s booze in there at all. 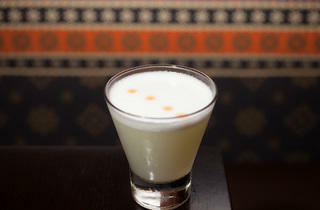 The classic pisco sour is the way to go—the drink is light, frothy and the ideal accompaniment to the spicier dishes. It’s not just the cocktails and food that work well together here. 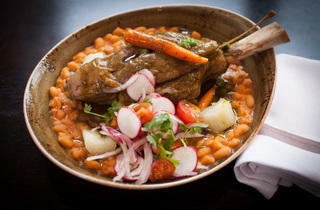 Everything feels so polished that it’s hard to believe Tanta hasn’t been a River North staple for years. I'd been wanting to go to Tanta for almost two years, and I finally made it this past weekend. Unfortunately, I was rather unimpressed. I had the cebiche tasting, and they were all unremarkable. My boyfriend had been raving about Tanta for months. It did not disappoint. I loved the vegetables and the pork fried rice. They make for great leftovers the next day. I did not like the pulpo, but I did like the clasico cebiche. We did not order an entree because there are so many great small plates. The cocktails are also unique and excellent.